Run-time reconfiguration provides an opportunity to increase performance, reduce cost and improve energy efficiency in FPGA-based systems. However, run-time reconfigurable systems are more complex to implement than static only systems. This increases time to market, and introduces run-time overhead into the system. 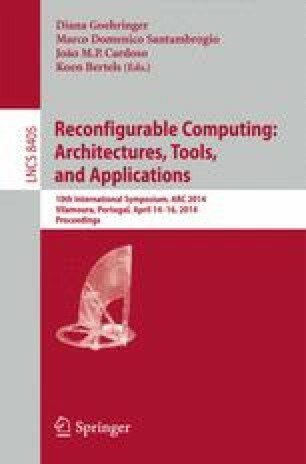 Our research aims to raise the abstraction level to develop run-time reconfigurable systems. We present operating system extensions which enable seamless integration of run-time reconfigurable hardware threads into applications. To improve resource utilization, the hardware threads are placed on a fine granularity tile grid. We take advantage of a relocatable module placer targeting modern FPGA to manage the reconfigurable area. The module placer accurately models the FPGA resources to compute feasible placement locations for the hardware threads at run-time. Finally, we evaluate our work by means of a case study that consists of a synthetic application to validate the functionality and performance of the implementation. The results show a reduction in reconfiguration time of up to 42% and more than double resource utilization. COSRECOS: Context switching reconfigurable hardware for communication systems (cosrecos), http://www.mn.uio.no/ifi/english/research/projects/cosrecos.